Creative photography techniques, and getting published. One of the main ambitions for a lot of photographers is to get published, and so when I talk to other photographers they’ll sometimes ask me about my experience in the publishing world. In today’s blog I’m going to shed a little light on my own experiences, and how creative techniques have sometimes given me a competitive advantage over other photographers. It goes without saying that having a portfolio to back yourself helps a lot, so getting your photos out in smaller local magazines is a good idea, even teaming up with some other people to self-publish a fanzine style magazine would be a good option. Once you have this though you really want to move up to the next level, that means getting paid, and getting paid gigs is seriously competitive. Look to be minimal I was told, I’d just walked out of a meeting with a publisher who I’d go onto contribute to for the next 4 years and counting. 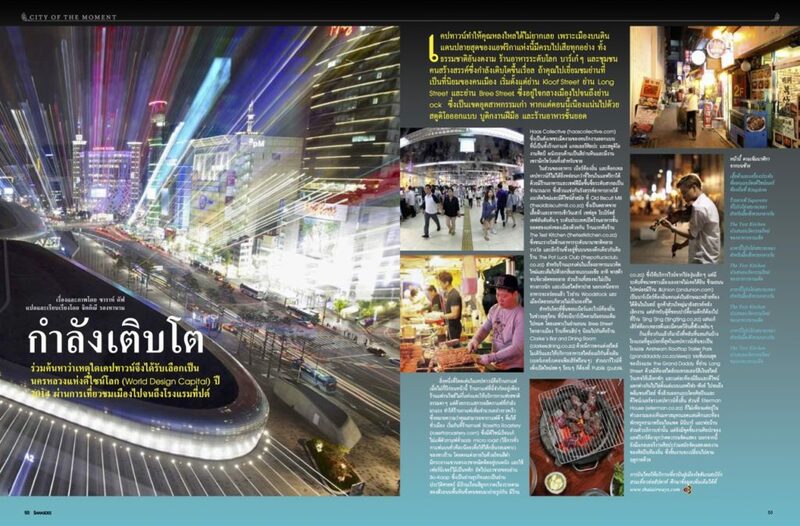 The result of that meeting in the short term was an article about destinations which the inflight magazine went to, seen through my crystal ball. It happens I was somewhat lucky as well, I contacted them just at the time they’d got a contract for a new magazine and they needed fresh content. They liked my crystal ball idea enough to make an article on it, and the idea would be used in a number of opening double page spreads for future articles as well. Now of course photographers try to learn new things all the time, and be as technically good as they can be. Once you’ve mastered the perfect landscape, and learned to take a well lit portrait with both natural and artificial light you’re in a decent place. If you go and check out a website like 500px it won’t take you long to realise there’s an awful lot of other photographers in that position as well though. So what’s going to make you identifiable as a photographer? In my case I had some out of the box creative ideas to give scenes a little twist, that’s what has set me apart from other photographers over the years. Now I’m passing that knowledge on, you can learn my techniques through the creative photography kit. 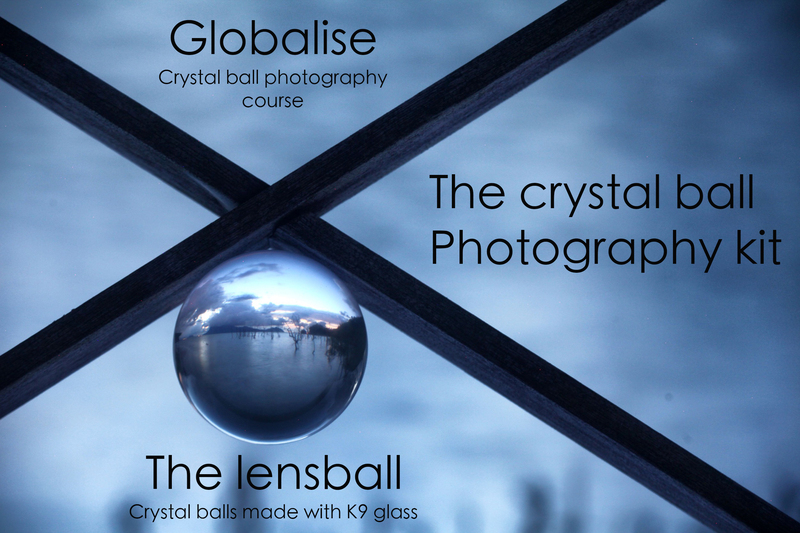 The crystal ball is a great tool for a photographer to have in the bag for it’s refractive qualities, and when used in the right place it can produce a unique image that tells the story of a place in a minimalist style. Getting this style of photo right isn’t quite as easy as it looks though, and there are a few tricks to help you get better results which you can learn here. This is an example of an opening double page spread using the crystal ball. 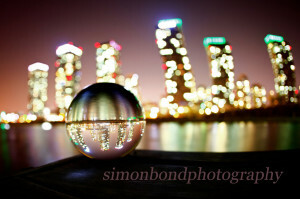 Using a crystal ball allows you to get a completely different take on a landscape photo. 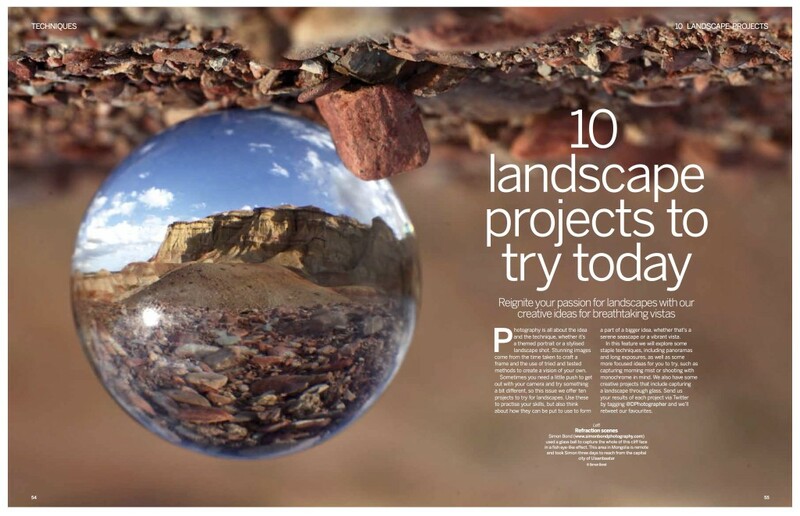 This is another example of a photo used as a opening double page spread, this time for a photography magazine in the UK. 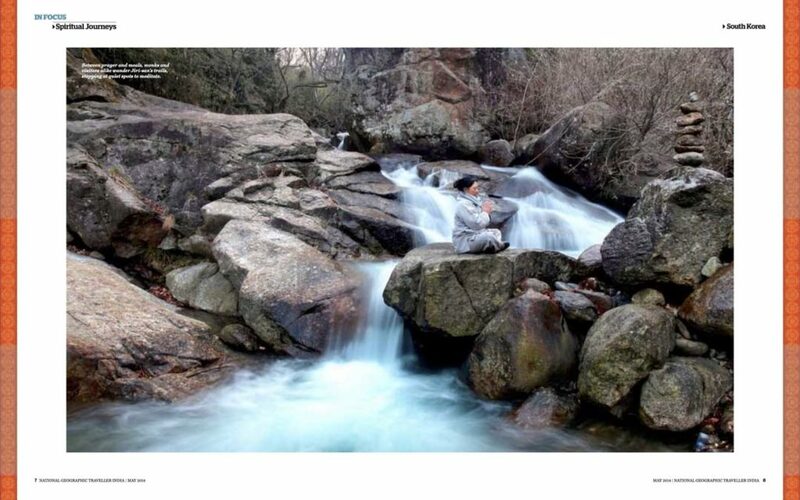 In this case the topic of the article was how you can take landscape photos in a creative way, and this photo perfectly demonstrates this idea. In fact in terms of composition both of these refraction images share a lot in common, the subject is a canyon in Mongolia this time though. This shows you how effective this technique can be then, not purely from a artistic point of view but also in a practical sense where these types of images can be used in publishing. 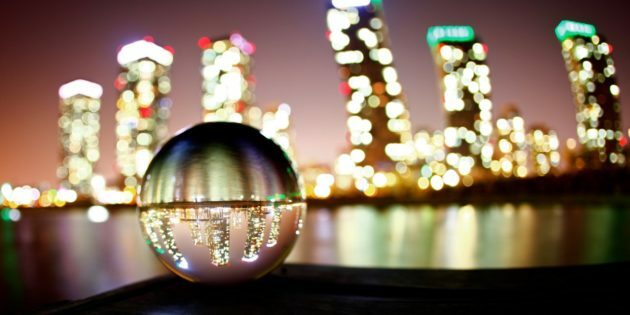 Photography remember is the art of subtraction, so going minimal usually works, and these images have the added bonus of packing in a lot of story in that glass orb. Using zoom in photography can create an energetic and dynamic image, it must be said these types of images are not always that minimal though! The main idea is to zoom out on a centrally located subject, and use the surrounding lights to light paint outwards from the central focus. 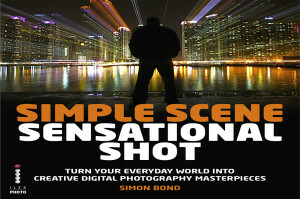 In the near future you can learn all about zoom photography from my course on light painting. The left page shows an image where the zoom technique was used. In this article the topic was Seoul by night, so I wanted to shoot the recently built Dongdaemun design plaza for this. The building is very modern, so I decided to use the zooming technique to give this image an even more futuristic feel. Now of course not all the photos I submit to a publisher will be used. 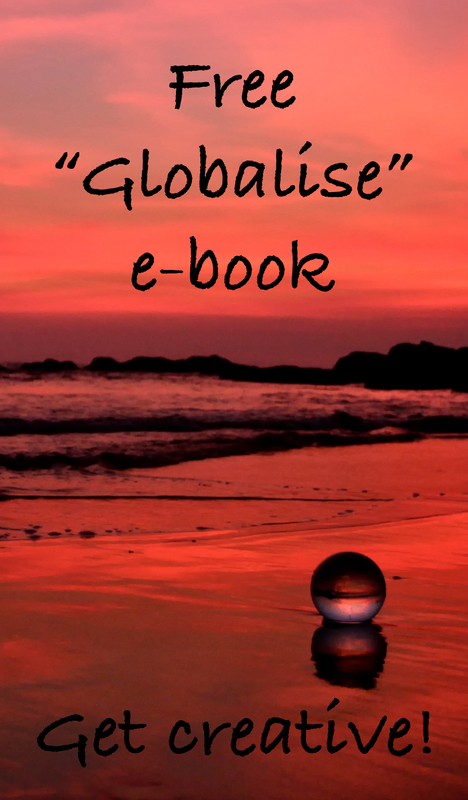 There were alternatives to the zoom technique which this publisher could have used; however in this case they elected to use the zoom burst, to go with an image that was edgy and dynamic. Once again this shows that the correct application of a visual technique can help a lot when pitching images to a new publisher. I’d certainly not advocate using the zoom burst all the time, but practicing this technique so you know when to apply it can lead to your work being published. Now using long exposure with photography is one of those tried and trusted methods, it’s not the most difficult thing to do, but choosing the correct location can make or break the shot. When done well though it’s going to rock a double page spread in a magazine, and in this case none other than National Geographic. When I took this shot it was a bit trickier than most long exposures though, because I wanted to keep the woman in the photograph sharp. Here a waterfalls motion is captured with long exposure. The exposure I used was 1 second at f13, I compromised on using a longer exposure for the water so that I could avoid motion blur occurring with the woman. 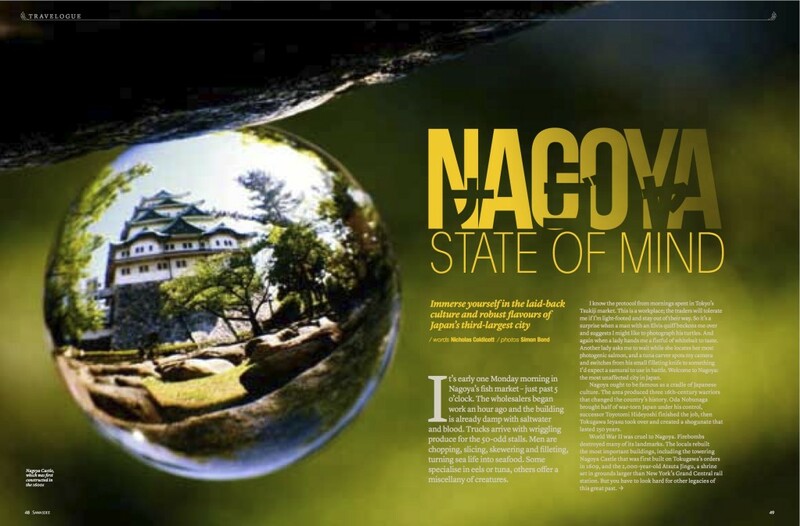 The result was a photo that shows the calm flow of nature, a person worshiping Buddha, and something very zen that went well with this particular article. During the course of photographing this article one of the monks spoke to me about a hermitage in this temple complex, how it taught monks that life has a flow, and so let life take you in the intended direction. This image here then formed an important part of the narrative for the wider article, and I used long exposure to achieve this. The lens used can also have a profound impact on a scene, one of the most extreme lenses out there is of course the fisheye. The fisheye can really give a scene a lot of distortion, it can also be used as an ultra-wide angle lens. The drawback with a fisheye is that it’s so wide that you might have difficulty avoiding distracting elements coming into the frame, or your photo might lack a clear point of focus. In this scene the fisheye warps the architecture, but leads the eye to the subject. In the above photo a fisheye lens was used in an escalator “tunnel”. The architecture provided lots of pattern, that in turn gave the image a nice minimalist feel. 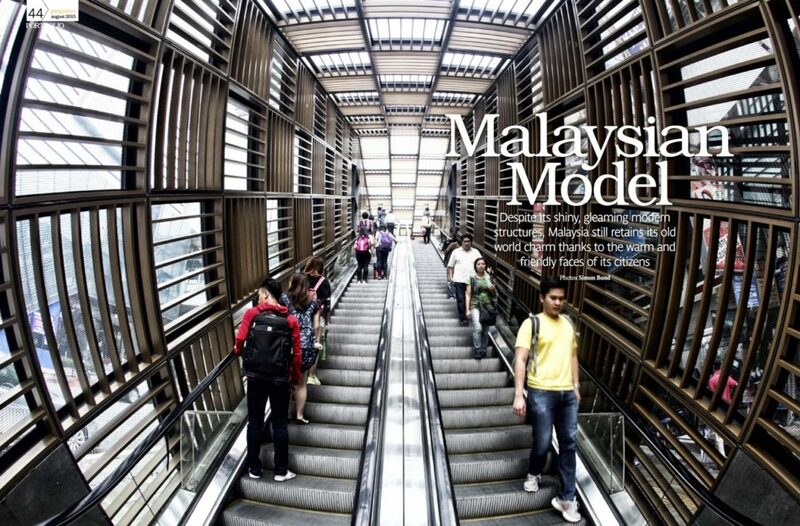 In this case the article was about “faces of Malaysia”, so the many different people using the escalator highlights that aspect of the article, and readies people for the images to come later in the piece. The fisheye can be a great lens for giving scenes a really big feel, and this works very nicely for an opening double page spread. I hope you’ve enjoyed reading this blog, and it might have given you some food for thought when it comes to the type of image you take. I’ve mainly talked about the opening double page spread here, though let’s be honest if you get that photo right you’re 90% of the way there in terms of getting the article. Editors and art directors are always looking for an image that goes BOOM, and offering them something a little outside the box is a great way to achieve this. If you’d like to try some of these ideas for yourself why not buy one of the modules on sale in the creative photography kit.